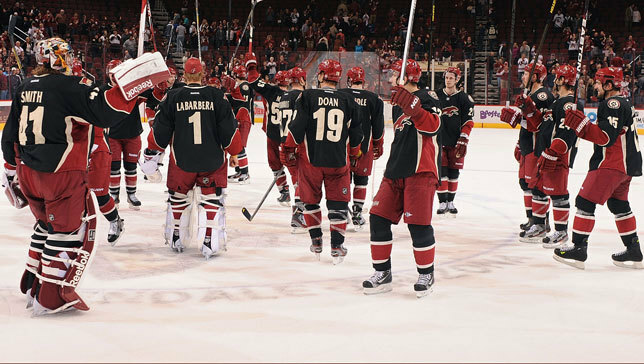 GLENDALE -- Coyotes President Mike Nealy would like fans to know just how grateful the team is for their support during the abbreviated 2012-13 season. The Coyotes enjoyed their highest season-ticket holder base since 1999 this season, and the team’s TV ratings on FOX sports Arizona skyrocketed – up 116 percent over last season. Nealy said he appreciates the consistent positive feedback the organization receives from fans about the experience they have when attending games and events at the arena. "Even with our staff numbers reduced 40 percent over previous years, the Coyotes have a dedicated, hard-working staff and service has not suffered."